The heavily Traditionalist and Maryami Philosophy and Religious Studies program at La Trobe University, Bendigo, Australia, has announced an Ananda Coomaraswamy Essay Prize. Two winners will collect books and postage to the value of $200 from Fons Vitae Publishing and $200 from World Wisdom Books (the in-house publishers of Frithjof Schuon). The prize calls for "essays that explore . . . the meaning of traditional symbols." Examples given include the drum of Śiva, the Rainbow Serpent of the aboriginal peoples of Australia, the shofar, and the hijab "in the mystical traditions of Islam." There are academic and non-academic alternatives: the prize has two categories, postgraduate and "open." The concept of concept of Eurasia (Avrasya) was developed independently in Turkey, and its exponents were initially critical of Dugin's Eurasianism. This, however, has now changed. In 2003, the Turkish translation of Dugin's Geopolitics was published as Rus Jeopolitigi Avrasyaci Yaklasim, and according to Laruelle "seems to have gone over well with part of the Turkish military"--especially among "army officers disillusioned by Turkey’s loss of clout in NATO and shocked by the Iraq war." Dugin's main supporter in Turkey is the Turkish Workers’ Party (Turkiye İşçi Partisi), a "small communist-leaning party." Nothing concrete has yet come of this, though one day it might. A continuing aim is "an interparliamentary Eurasian assembly, including not only Russians and Turks, but also representatives of Iran and the Arab states." Eurasianism in Russia's ruling party? My colleague Andreas Umland has raised the question of the significance for Alexander Dugin's Eurasianism of the appointment of Ivan Demidov as the chief ideologue of United Russia, Russia's ruling party ("Новый главный идеолог России," Glavred, April 1, 2008). Demidov knows Dugin, having collaborated with him on Spas (the Orthodox TV channel on which Dugin has a program). Demidov has in the past expressed his admiration for Dugin ("doubtlessly, a crucial factor, a certain breaking point, in my life, was the appearance of Alexander Dugin"). According to Umland, Demidov has emerged as a "defender of Russia as a unique world civilization and an independent great power," which is certainly compatible with Eurasianism. On the other hand, he clearly rejects some of the more extreme positions associated with that movement, stating that "the word 'Russian' and 'fascism' are antonyms," and that he and his allies will fight against "the introduction of the term 'Russian fascism' in the mass consciousness." Guénon and Jeanne de Salzmann? There are rumors of a meeting in Cairo between Guénon and Jeanne de Salzmann (as in Gurdjieff), and I am told that de Salzmann's current followers often value Traditionalist works. Any further information on this would be much appreciated! 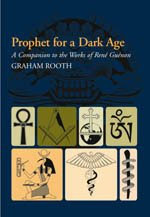 Just published: Graham Rooth, Prophet for a Dark Age: A Companion to the Works of René Guénon (Sussex Academic Press, 2008). 400 pp. Paperback £29.95 / $59.95. ISBN: 978-1-84519-251-8. "This book provides an overview of Guénon’s work. It is arranged in four parts each of which provides extracts that express his views directly and commentaries that summarize or paraphrase his written work. The objective is to allow Guénon to speak for himself rather than produce a critique of his ideas." Good to see such a book coming from an academic press, as I said in the foreword to it.